Luxury villa vacations truly offer the best escapes - your own private space while enjoying all the benefits of a first-class hotel. In Sanskrit, Avani means Earth and Laya means Abode. 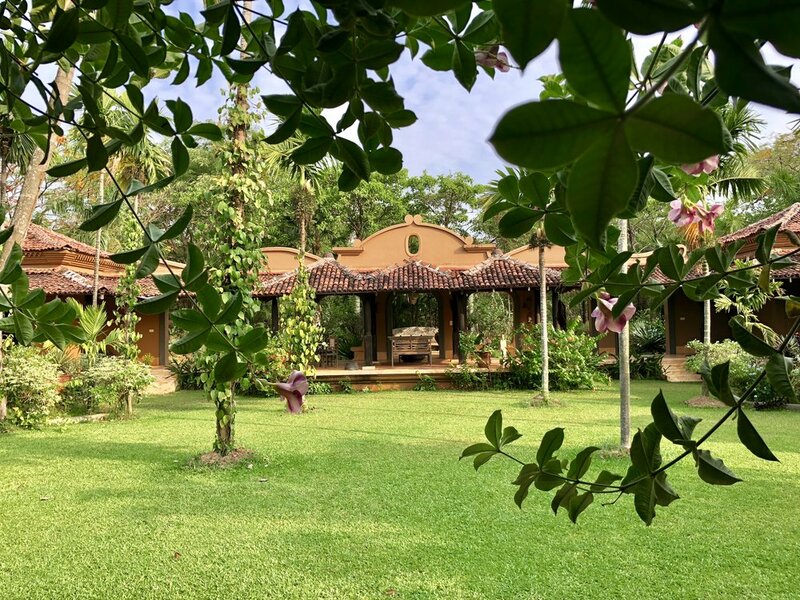 Avanilaya Resort is made up of three beautiful villas -- Villa Padimunu, Villa Panchavatti and The Third Place -- located on 24 acres of unspoiled countryside. Tucked within a lush natural setting and eco-friendly design, it is the best-kept-secret in the village of Corjuem near Aldona, with in-house chefs and spa services. The lush gardens teeming with birds & wildlife and the sweeping panoramas is the definition of a luxe boutique resort. A very private paradise, perfect for family holidays, honeymooners, writers/artists, and stunning weddings. Avanilaya is listed as one of the 50 most beautiful hotels in India! See us in House and Garden UK! A traditional courtyard design of generous rooms around an ornamental garden, with a long wrap-around veranda, infinity pool and extensive lush gardens. Inspired by the traditional Indo-Portuguese architecture of Goa with unique rooms and a central courtyard swimming pool, surrounded by verdant gardens. The more contemporary architecture of this villa has spacious rooms and an infinity pool with a jacuzzi at the edge of a multi-tiered landscaped yard. From a private & intimate ceremony to an elaborate multi-day affair filling all the villas with your closest loved ones, our breath-taking location, stellar cuisine, and luxe accommodations are the perfect starting points for creating the unforgettable wedding of your dreams. Many cherished holiday memories often involve outstanding dining experiences. Avanilaya offers a wide variety of fresh choices from Goan, Continental, and Fusion cuisine. Our in-house chefs can help customize the menus to meet your culinary needs – whether it is a romantic candlelit dinner for two or a milestone birthday celebration for two hundred. All ingredients are freshly procured. The picturesque settings of Avanilaya has been the backdrop for some spectacular movie shoots from Bollywood. See if you recognize us in any of these movies! We’ve also been featured in magazines & other publications.